The SteelSeries Arctis 3 Bluetooth hails from one of our favorite series of cans which makes gaming comfortable and much more immersive. This model is one of the unique offerings in the market due to its multi-platform capabilities which makes it an all-in-one audio solution. The SteelSeries Arctis 3 Bluetooth is a swiss knife in a stagnant, but highly competitive segment, but how does it fit considering its unique skill set and pricing? The SteelSeries Arctis 3 Bluetooth utilizes the same design formula as the other Arctis headsets because frankly, its one of the most successful designs in the market. The Ski headband design makes the pair lightweight and easy on your head, so using it for extended periods will not induce headaches. The one downside of the headband is its a bit smaller than most competitors, so bigger heads might find it too tight. The 90-degree rotating earcups also profoundly contribute to the comfort factor of the SteelSeries Arctis 3 Bluetooth. It makes the device easier to wear and take off, plus stowage in narrow spaces such as slits in bags is easy as peas. The oval-shaped over-ear cups clasp on you the sides of your head lightly, but the narrow depth could make some users uncomfortable. The Arctis series of cans offer surprisingly excellent build quality despite being so light. Holding the set for the first time can induce some doubts about its longevity in your arsenal, but it’s surprisingly more durable than other gaming headsets. The adjustable flexible band is a nice touch as always, plus, there is a variety of designs to choose from. The SteelSeries Arctis 3 Bluetooth is designed to be used wirelessly, so all of its controls are neatly placed on the earcups. 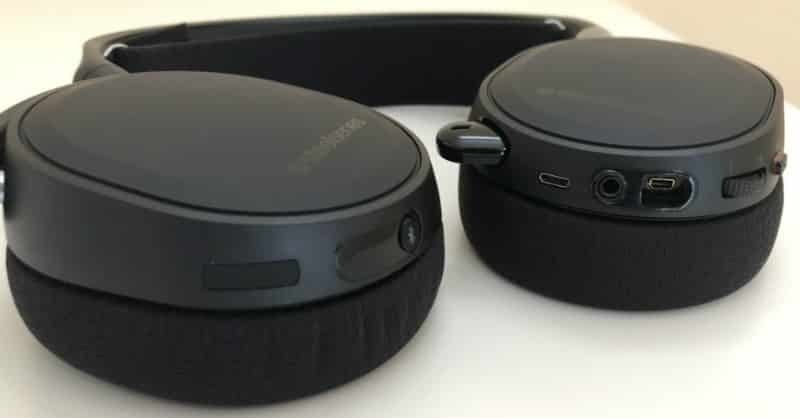 The left cup holds three ports which include a micro USB connector for charging, a 3.5mm out jack so you share audio with another headset, and a specialized port for the headset’s main cable. The volume wheel and mic mute button are also present on this side, but they are located a bit too far to the rear. Wireless headset controls are almost always placed on the cup which holds the mic. 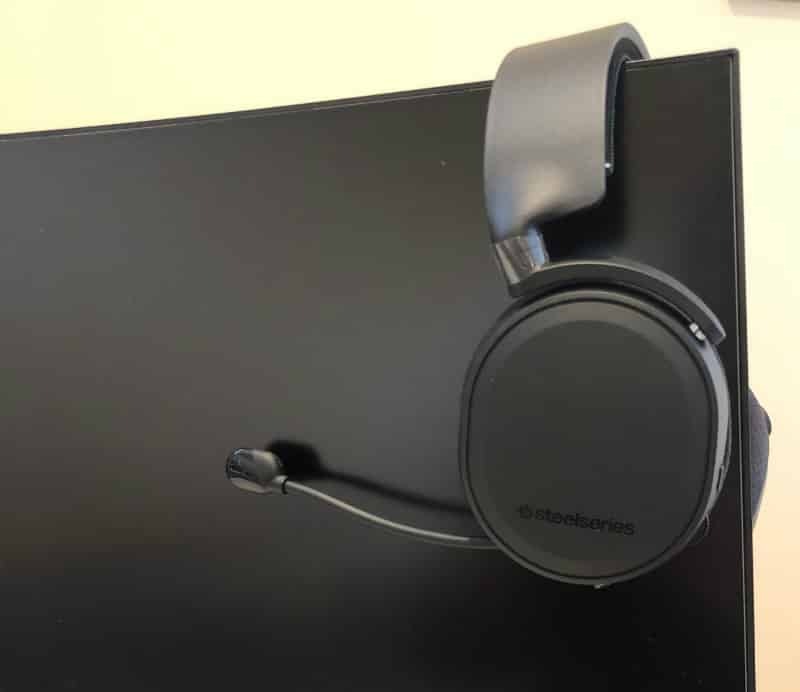 The SteelSeries Arctis 3 Bluetooth utilizes a retractable boom mic with a flexible stem which makes it easy to position the device for clear comms. The microphone is bidirectional, allowing the SteelSeries Arctis 3 Bluetooth to transmit your voice as clearly as it can no matter what your preferential positioning is. The right cup isn’t as heavily equipped as the other since it only has the dedicated Bluetooth button. Take note that you have to press it for four to five seconds to hear a beep and light the green LED to make the device discoverable. Pairing mode takes a bit more effort, requiring a minimum of seven seconds which will induce a quick beep and red flashes on the indicator LED. It’s also worth noting that the SteelSeries Arctis 3 Bluetooth does not have RGB lighting like the Arctis 5 and Arctis 7. Decorative features aren’t essential, but we’d like some eye candy at this price. The device still looks great, but patterned headset bands isn’t something that would sway a buyer as much as aesthetic lighting. The SteelSeries Arctis 3 Bluetooth’s value lies in its comfort and audio performance, with the latter weighing in more due to the pricing. But no one wants a bench vise for portable audio either, so thankfully, this model is as congenial as its predecessors. Some may dislike the Ski headset design, but its one of the most ingenious ways a manufacturer can ensure that the product is well-supported without clamping down too hard. 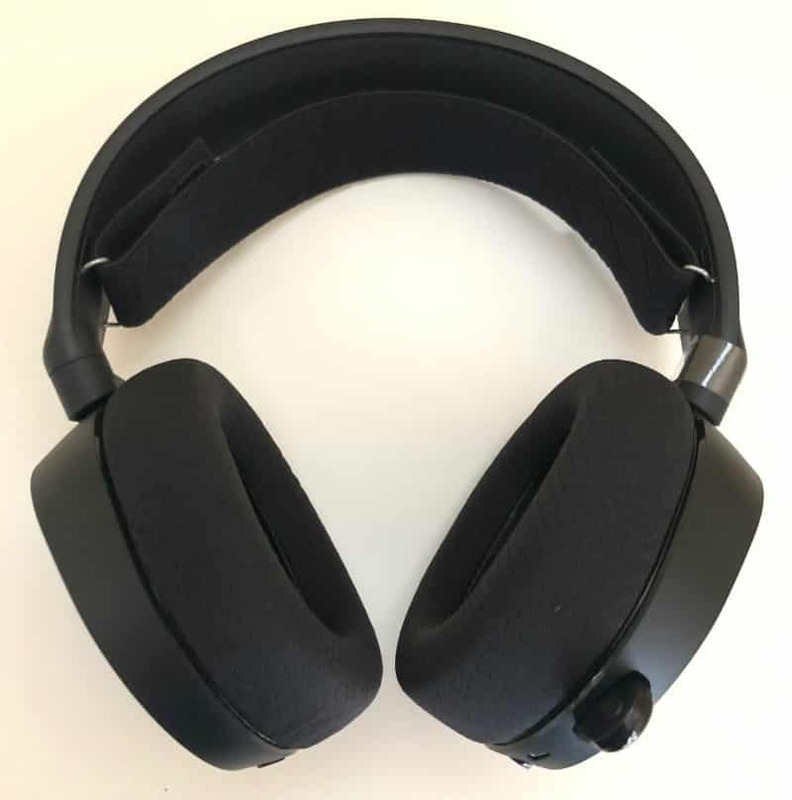 Our biggest complaint on the SteelSeries Arctis 3 Bluetooth’s design is the shallow ear cups, which thankfully, is solvable. The problem is you need to spend a few extra bucks on velour or leatherette cushions from the SteelSeries website. They aren’t overly expensive, but most would expect alternative sets in the package at this price range. Audio quality is one of the strengths of the SteelSeries Arctis 3 Bluetooth, although we know gamers will look elsewhere. The pair’s sound signature is balanced on every aspect, with crisp highs and a decent range on the mids. the lows or the bass isn’t overpowering which makes the headset great for music, but gamers will look for extra oomph. 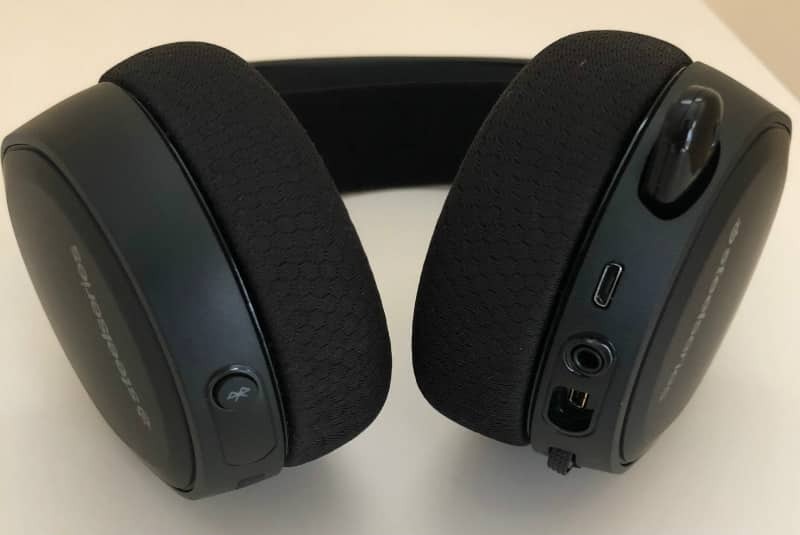 The SteelSeries Arctis 3 Bluetooth’s soundstage is also reasonably big despite the closed-back earcup design. This characteristic is great for shooters such as PUBG or Rainbow 6 Siege, but the lack of bass will make firefights and pounding explosions less convincing. The product also doesn’t include built-in surround emulation capabilities, unless you use Windows Sonic, which is troublesome to set up. The SteelSeries Arctis 3 Bluetooth works great when wired, but its main attraction is its Bluetooth connectivity, which is, unfortunately, limited. You can only use the function with PC and smartphones, leaving out gaming consoles like the Xbox One X. You are going to need the included 3.5mm cables to use this pair with the Xbox or a PlayStation. However, the SteelSeries Arctis 3 Bluetooth works great with the Nintendo Switch which was one of the main targets of the device. The Switch uses an application-based voice comm implementation instead of VOIP, giving gamers more versatility. You can connect the headset to the switch via an AUX cable to listen to in-game audio, while the Bluetooth connectivity takes care of voice chat via a compatible device. The biggest downside of the SteelSeries Arctis 3 Bluetooth is the slight delay on the audio output when using it wirelessly. The Bluetooth function surely makes the pair more versatile, but the unsolved latency penalty is still present. This caveat shouldn’t matter for casual gaming, but competitive scenarios in fast-paced titles will reveal the disadvantage. The microphone on the SteelSeries Arctis 3 Bluetooth is a bit quiet compared to the other upper-end Arctis models. Tweaking the pick-up sensitivity settings in your preferred app can easily solve this flaw, so its a minor drawback to a great device. 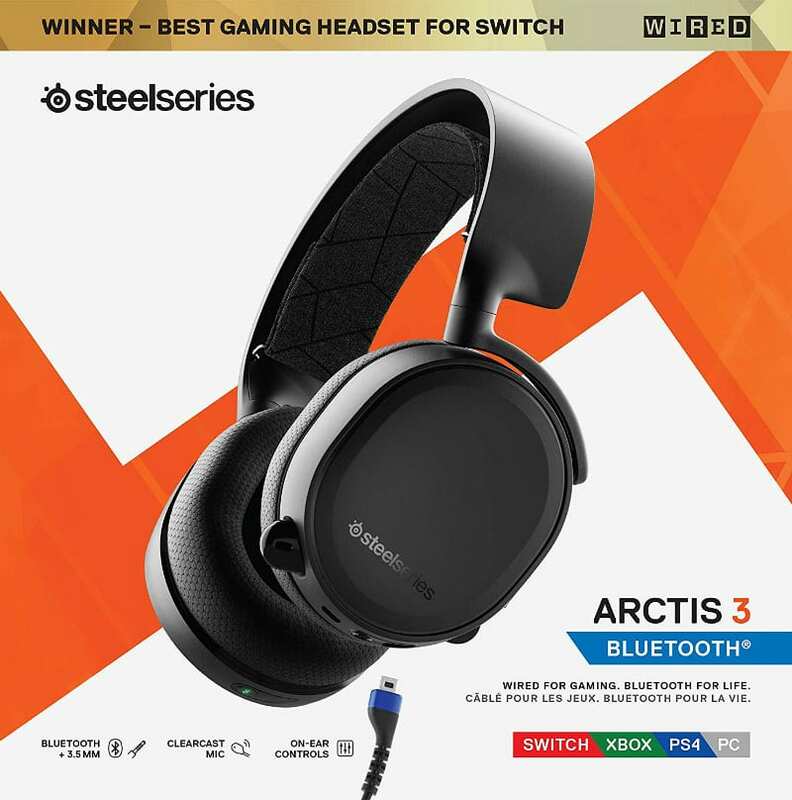 The SteelSeries Arctis 3 Bluetooth is a well-rounded and unique headset that’s highly suitable for the Nintendo Switch or as an all-in-one portable audio solution. The pair works flawlessly with most devices, although some platforms such as gaming consoles may incur a few quirks save for the Nintendo Switch. The sound quality and comfort of the set are superb, especially if you’re a gamer who doesn’t need 7.1 surround sound. The SteelSeries Arctis 3 Bluetooth used to be expensive at around the same retail cost as the better-sounding Arctis 7. However, pricing has dropped from our favorite retailers to around the $100 mark, increasing this variant’s bang for every buck. The SteelSeries Arctis 3 Bluetooth is a must-buy if you are in the market for a versatile, all-in-one solution for balanced and great-sounding audio.